Back at the beginning of January, I wrote that this season was already shaping up to be season that winter forgot in the U.S. About a month later, that prediction is coming true. The average temperature in the continental U.S. in January was 5.5°F above the 20th century norm, and snow was almost nonexistent  the National Weather Service reported that 157 out of 166 American cities had below-average amounts of the white stuff. The groundhog Punxsutawney Phil may have predicted six more weeks of winter when he popped up from his hole on Feb. 2, but for most of the U.S. winter never really began  and the unusually mild days seemed like a coming attraction for global warming. Across the Atlantic, much of Europe is suffering through a winter of historic  and deadly  proportions. Over 600 people have died from the intense cold that has gripped the continent over the past few weeks, with the most severe toll recorded in Eastern Europe. Over 5,000 Russians have suffered from hypothermia or frostbite while the country has seen 20 days of unusually cold weather when temperatures fell 13°F to 25°F below normal and Moscow on Feb. 13 endured temperatures of -4°F. (It could be worse though  temperatures in the northern Russian city of Toko fell to -63°F.) 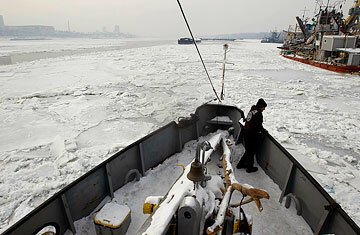 In Central Europe, the commercially vital Danube River froze for hundreds of miles, from Austria to its mouth in the Black Sea, forcing officials to take chain saws to the ice. Things are so bad in Hungary that the central bank has been compressing billions of old notes into briquettes that can be burned for heat. If the climate's still warming  and it is  word didn't get to Europe. So how can two parts of the world be experiencing such radically different winters? It's not climate change  or at least, mostly not. The weather pattern that's bringing all of that frigid air to Europe  and holding it in place  is largely due to a naturally occurring climatic pattern called the Arctic Oscillation (AO), which describes how air pressure is distributed over the Arctic regions and the mid-latitudes of the northern hemisphere. The pattern comes in two phases: a negative one where there is high air pressure over the North Pole and low pressure at the mid-latitudes, and a positive phase when the pressure systems has reversed. Essentially, the AO describes how the winds are blowing  and as the AO changes, it can bring warmer or colder wintertime weather to the U.S. and Europe. At the start of winter, the AO was in a positive phase, which kept cold Arctic air from bleeding south. That helps explain why temperatures were so warm in January in the U.S.  the cold never had a chance to make it very far south. But over the past several weeks the AO turned negative, which moved the jet stream south and brought extreme cold weather to Europe and much of Asia. The effect was amplified by a strong and persistent high-pressure system that has remained stuck across Russia, which brings more cold Siberian air into Western Europe. The result has been a freezing February for most of the continent. Why hasn't the shift to a negative AO brought cold weather back to most of the continental U.S.? Thank  or blame, if you like to ski  another pressure pattern, the North Atlantic Oscillation. The pattern has remained positive, which tends to keep winters in the eastern U.S. mild and wet. La Niña is still in effect as well, which tends to shift storms away from the American Southeast. That's one more reason why there's been so little snow this season in the U.S.  quite unlike the past two winters, when a strongly negative AO led to record-breaking Snowpocalypses. The extreme cold in Europe  and the balminess in the U.S.  should serve as a reminder that as powerful as climate change is, our daily weather tends to be driven by short-term meteorological phenomena. But global warming isn't completely blameless  some scientists believe that the rapid melting of Arctic sea ice might actually be influencing winter-weather patterns in the northern hemisphere. As the cap of sea ice melts  and Arctic sea ice hit its second lowest level on record this summer  huge amounts of heat are released from the sea into the colder air above, causing the air to rise. That can alter air pressure between the Arctic and the mid-latitudes, changing wind patterns. It's the Arctic paradox: as the top of the world warms rapidly, it could actually create conditions that favor negative AO, which could in turn lead to cold winters in the U.S. and Europe even as the climate as a whole continues to heat up. The precise effects of climate change and melting Arctic sea ice on winter weather is still far from clear, however. We'll need more research and more winters. But in the meantime, the human cost of Europe's deep freeze shouldn't be forgotten. Environmentalists write a lot about the need to adapt to a warmer future, but that still goes for extreme cold as well. It's little surprise that the death toll was highest in poorer nations like Ukraine and Romania, but there's still no reason that hundreds of people  most of them homeless  should be dying from the cold in present-day Europe. Even in a warmer world, winter can still be deadly. See "Fighting Climate Change by Not Focusing on Climate Change." See "Melting Arctic Ice: What Satellite Images Don't See."